Flash flooding is the most common natural hazard in Colorado Springs. Flash floods tend to occur from May through September, and are usually caused by thunderstorms that are out of sight and hearing range of people downstream. Runoff from the mountains can quickly cause the water levels of small creeks and dry streambeds to rise to unsafe levels. These walls of water are fast moving and can easily reach heights of 10-20 feet. Know which streams and waterways are nearby, and where you are in relation to them. Learn More (video). You should never attempt to cross an area that is flooding. It only takes 6 inches of fast moving water to knock you off your feet. 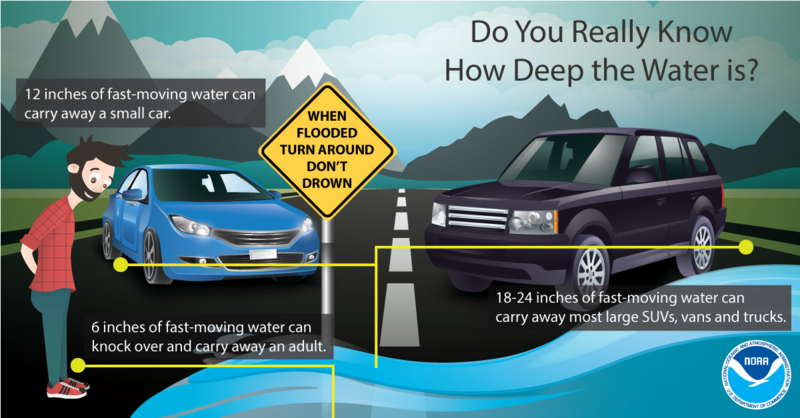 Just 10 inches of moving water can move a car, and 18 inches can float your vehicle. Your best course of action is to immediately seek higher ground. An urban and small stream advisory means that isolated flooding of streams, streets, and low-lying areas, such as railroad underpasses and urban storm drains is occurring. A flash flood watch means that flash flooding is possible. Be alert and prepared to move to high ground. Watch for rising water levels or unusual street flooding is possible. Listen to local radio or television stations or Weather Service radio for possible flash flood warnings and bulletins. Locate a hand crank or battery powered radio and extra batteries. A flash flood warning means that a flash flood is occurring or is about to occur. If necessary relocate immediately and seek high ground away from high risk areas and water. Do not attempt to cross moving water either on foot or in your vehicle. If you see clogged inlets or other public drainage infrastructure problems, report it immediately. Create a plan to move everyone in your family to higher ground during a flood event and make sure each member of your family understands the plan. Have a 72-hour kit ready to go in case you need to evacuate – Remember the 6 P’s in your planning – papers, pills (medicine), phone, pets, purse (money) and photos. Stay aware of local flash flood warnings through local radio, TV and on www.weather.gov/pueblo. Have a battery-operated radio available. Register your phone (landline or cell) for emergency notifications at http://www.elpasoteller911.org/. Take photos of your belongings in case you need to file insurance claims after a flood event. Move to higher ground and avoid areas subject to flooding. Do not attempt to walk across flowing streams, drive through flooded roadways or allow children to play in drainage areas (just 6 inches of moving water can knock an adult off their feet). If water rises in your home before you can evacuate, move to the top floor, attic or roof. Reserve the use of 9-1-1 for life-threatening emergencies. For non-emergent needs requiring public safety response, call 444-7000 within City limits or 390-5555 in El Paso County. For information related questions, call Pikes Peak United Way Information & Referral at (719) 955-0742. To see if your home or neighborhood is in a flood risk area, view the map below. Or, open the map in a new window. This map will NOT save your life, property, or public health. Citizens must take personal responsibility for protecting their own safety during flash flood occurrences. Any property downstream of a burned area has risk . This product is intended for planning purposes only. Post-fire conditions have elevated the flood threat, including areas that are not yet mapped. Other low lying areas may be threatened. Please contact your insurance agent or visit www.floodSmart.gov to evaluate your insurance protection options. The post-fire BAER team (citation) has indicated that potential water and sediment flow from the burn area may have increased by 350%. This site will include additional information regarding post fire hazards as it becomes available. The recent Waldo Canyon Fire has significantly changed the landscape, presenting risk of debris flow and flooding. Hillsides once protected by vegetation have been compromised and precipitation could have significant impacts on the landscape. Residents both in the burned area and those downstream of those areas should be prepared for potential flooding and are strongly urged to purchase flood insurance.